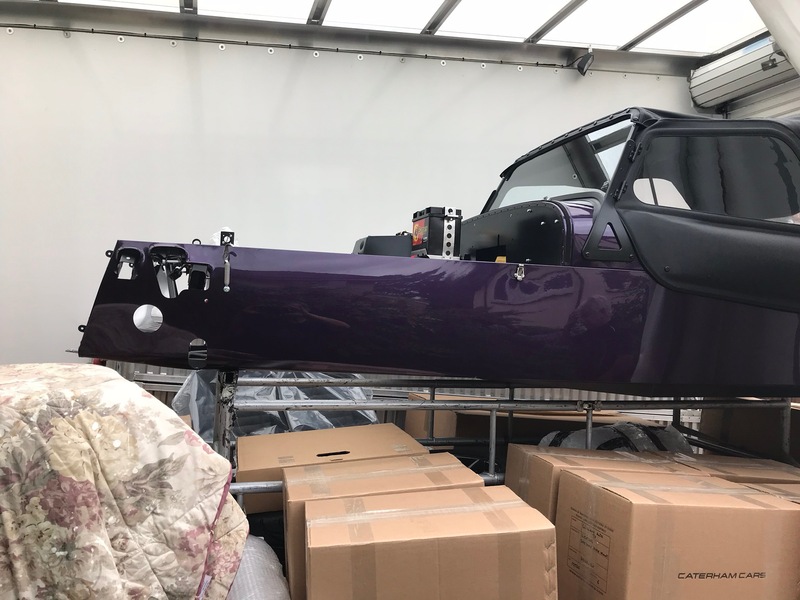 After 151 days since putting in our order, the Purplemeanie Caterham 420R Kit Car has arrived! … And at just after 11 this morning the Caterham driver arrived. We had a cup of tea and then got to moving the boxes and chassis into the garage. 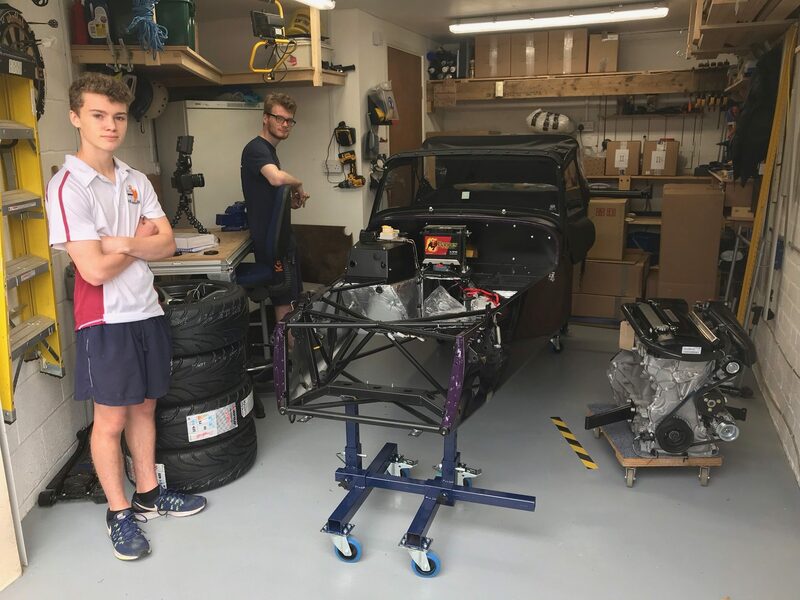 This became a four person task and so was completed in no time (Harry has been looking forward to helping out and was waiting for the driver, Joe arrived back from a rugby training session just in time to help out too). 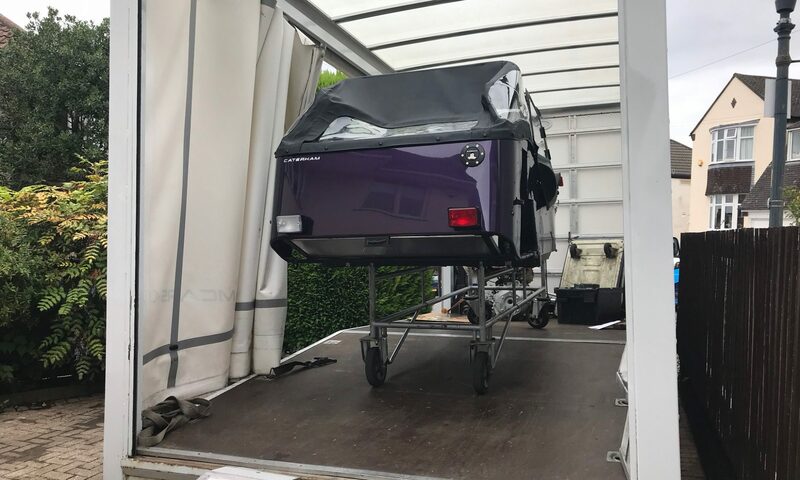 Even with a few chats with the driver we managed to get everything unloaded and stored, including doing the paperwork, in less than an hour. As well as the regular paperwork the driver left us with a business card for Derek Howlett. I’m hoping that Derek and I do not get too well acquainted, and that’s not a reflection on Derek, I’m just hoping we have a fairly complete kit. Colour is looking great by the way. Sue and I are both very happy so far. Driver said it’s the first car he’s ever delivered in this colour – cool! I got a couple of GoPro’s set up as we unloaded and I’ll work to get them included in the first VLOG that goes onto YouTube soon (hopefully). 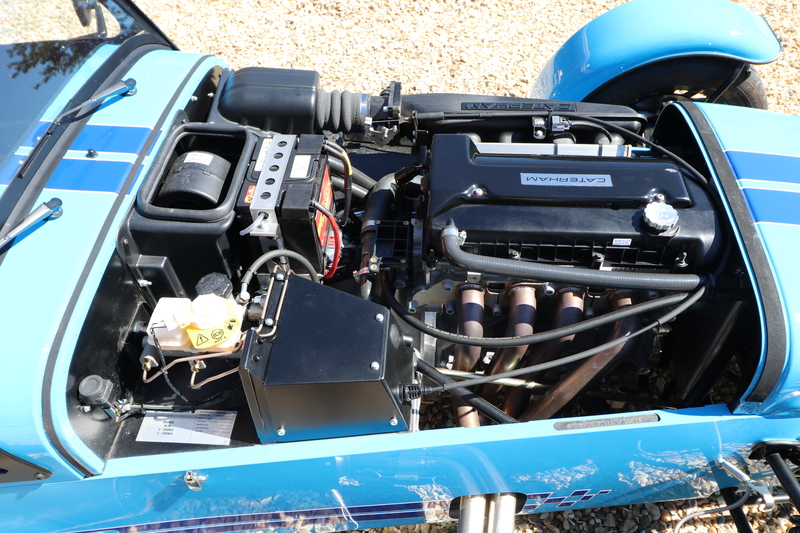 A note to those thinking of building a Caterham… the CJ Autos rolling axel stands worked well today. 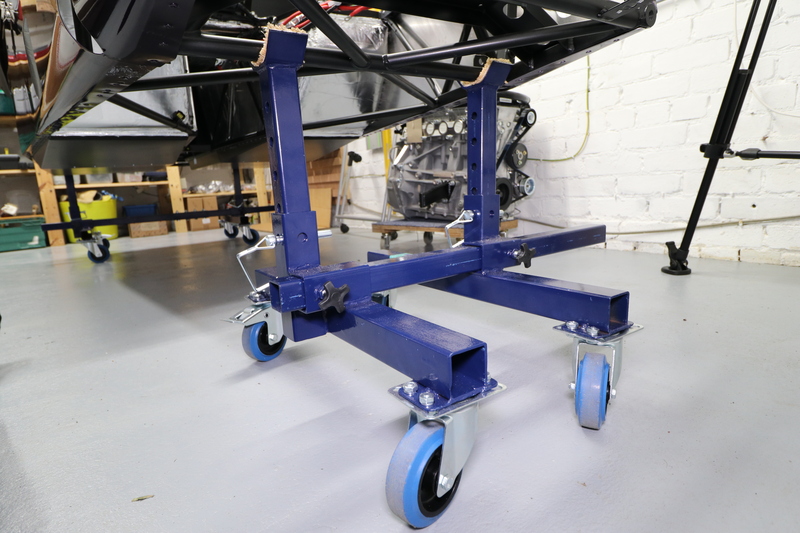 The process of getting the chassis onto the stands involved firstly getting it down onto the wheels/tyres then lifting it onto the stands. 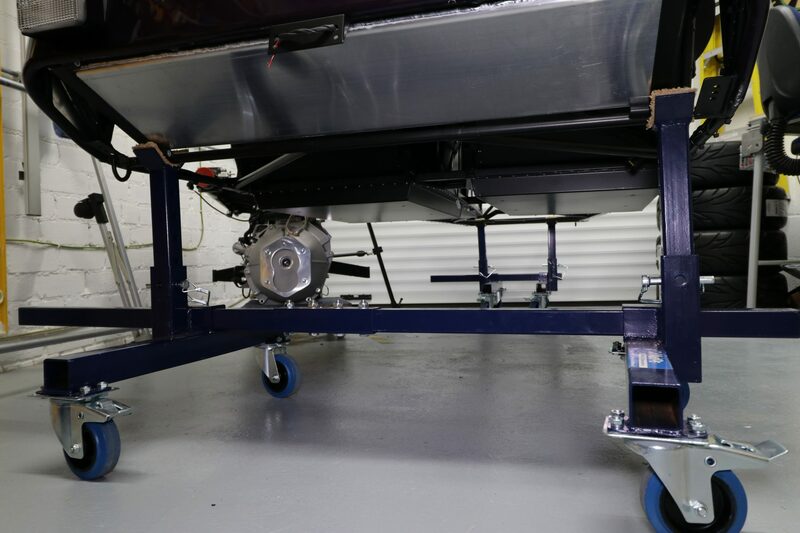 The fact we could do that in the relative space of the drive and roll the chassis into the garage was a great help. I’ve also found myself rolling the chassis around the garage already to make more space. One of the first jobs tomorrow is going to be to re-align and trim the excess square tubing off the ends of the cross members both front and rear – I’m going to bark my shins on them way too many times otherwise. We also dropped the engine onto a home made trolley that I’ve had around for years. 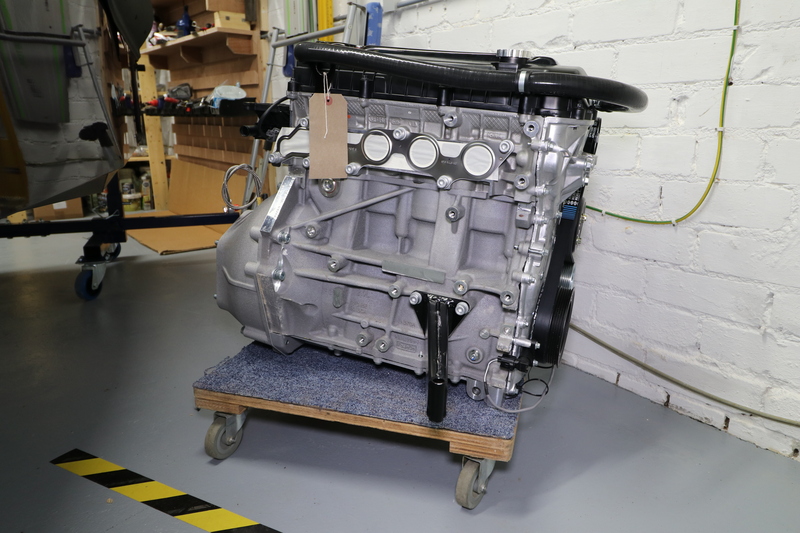 The engine sits very solidly on the trolley and that’s going to help with flexibility in the early stages of the build too. The OCD in me needs to shift it so its square on the trolley though! As soon as the driver had left, we had our first visitor. Two doors down from us lives Pete. Pete has two old Lotuses, neither of which are on the road at the moment. Pete came to see what one of these “new fangled things” looks like. I think he went away impressed. 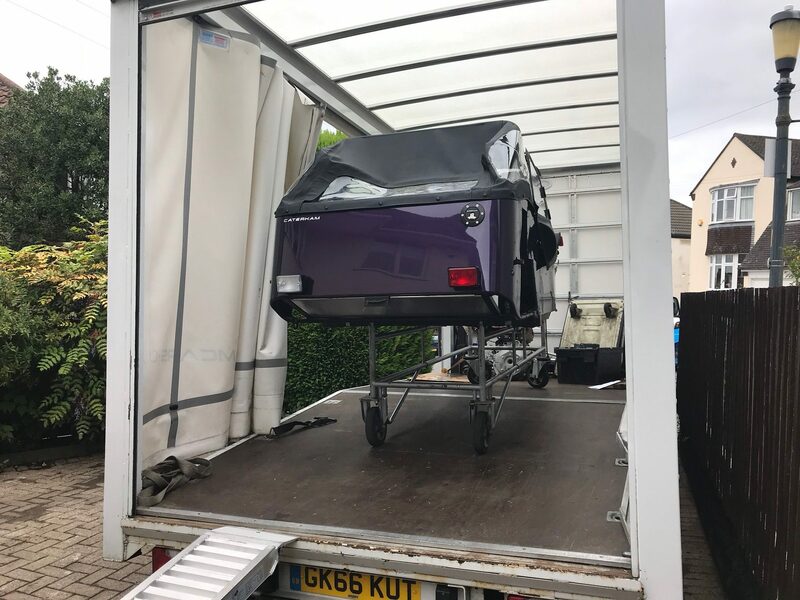 I hope to see plenty of Pete through the build process and he’s also kindly offered an engine hoist from his collection of tools which will come in very handy, hopefully, shortly. Seeing as today was a regular work day I couldn’t spend more time than was needed just to unload and store the boxes. There were 18 boxes and a few bubble wrapped items (exhaust silencer, nose cone, seats and oil cooler). There is only one shortage – the bonnet (hood for you non-UK people). 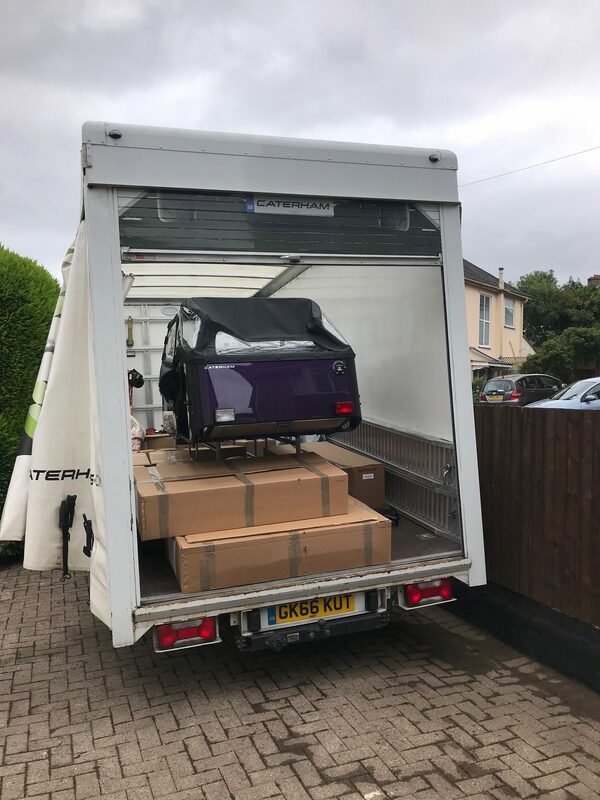 As Caterham were loading the van yesterday they noticed that the bonnet had a couple of blemishes and they decided to rework and then ship. Top marks to Caterham for spotting this and making the right decision. And to be honest, not having the bonnet at this point is actually a bonus – keeps it out of harms way for a couple of weeks while we work on other things. Surprises: yep, there were a few. Firstly, the car has come with the hood (that’s the roof for our American readers) already fitted. All “poppers” for the full hood have already been fitted and the hood is in place. It seems that Caterham have recently decided that this saves headaches in the future where people screw up the installation of the poppers and make a very expensive mistake. I’m wan’t necessarily looking forward to that part of the build and it will have taken a few hours off the build time, but, it seems a kit is now more and more like a finished car. I was also surprised to get a printed build manual. I thought I’d read that Caterham had stopped sending them out. I’m not planning to use it as I’ve been keeping notes and changes in an electronic version on an iPad, but I’ll have a read through just to make sure its not and different to the one on line. Once all my meetings today had concluded we could spend some time figuring out what we’ve got. It’s still early days on checking through the parts that have arrived but in all the major items seem to have arrived. I had rigged up a DSLR in the house to get an overhead view of the parts laid out on our kitchen table. The idea is to have a photographic record of what’s arrived and to be able to review the contents of a box without having to actually find the box, open it and rummage around. I’m hoping this will cut down on searching time. So, we spent a couple of hours pulling boxes from the garage, unpacking them, photographing the contents and then repackaging and putting the boxes back into the garage. We also to the opportunity to put some items back on the garage shelves without being in boxes. We’ve managed to get rid of four large boxes already and will help getting around the single garage. I’ll put a montage together of the pictures we’ve taken and post that soon. Taking a lead from Adam Savage (of Mythbusters fame) the task of laying out all your components before a project build is known as Knolling. It’s what OCD people (like me) do before building a lego set – lay out all the bits and pieces so you know what you’ve got. I’ll post a Knolling picture soon. On the topic of storage – items we’ll need later will be stored in an office I have in the garden. Wheels, Nose Cone, Seats, Rear Wings and Roll-bar will all go out there for the time being. Having gone through all the boxes it strikes me that I haven’t seen any front wings yet. I’ve seen the wing-stays and various mounting kits but no wings themselves. I’ll need to have another look around and see if I’ve overlooked them. If they’re not to be seen then it’ll be a call to Derek on Monday. 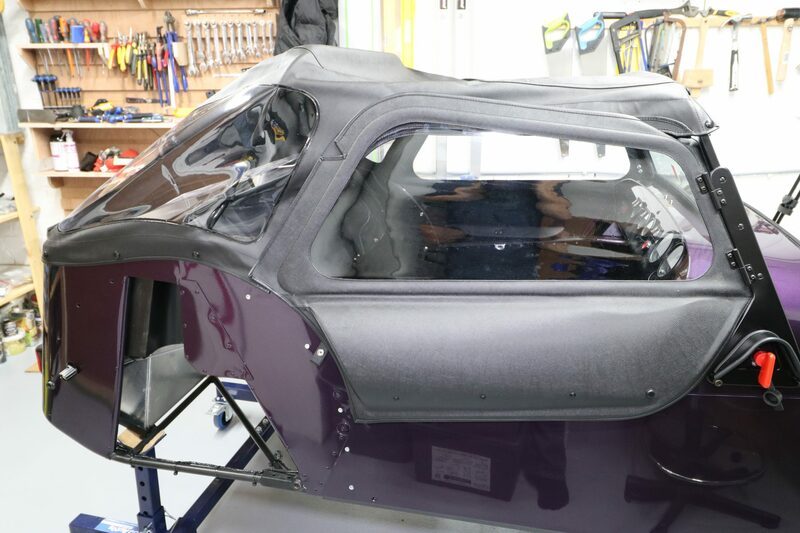 UPDATE: I found the front wings in the passenger footwell… we hadn’t ventured that far into the car until I went looking for the wings – the fact that the hood is already on meant we just hadn’t got to sticking our heads into the cockpit fully. It’s been really hard to resist actually fixing anything to the car today. I’ve been dying to actually start to put something onto the car… but better to be patient and get things in order before the onslaught. That’s all for today. Kit delivered, knolled and stored. The next post will probably be the start of the build – finally. 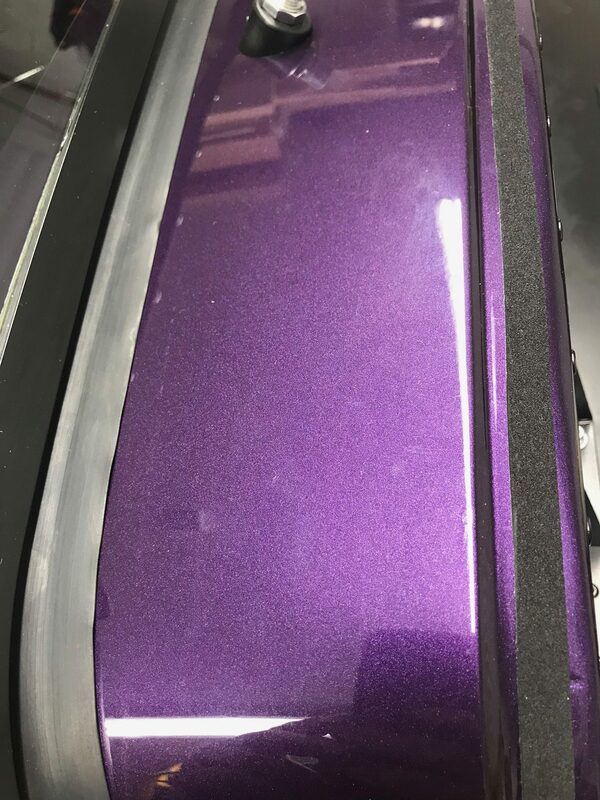 Breaking news: The Purplemeanie 420R is now “in build”. 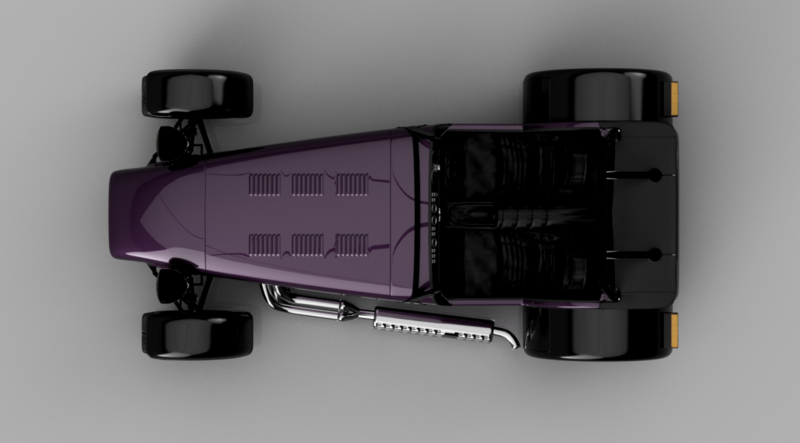 Caterham have updated their online systems to show that the car is now being built. Delivery is still likely to be end of July or early August. For those of you that have been asking… the Caterham 420R kit car delivery date is delayed but is now on what Caterham has as a production line. When we’d ordered the car we had been given a build week of Wk26. This recently then slipped to Wk28 but is now showing on Caterham’s online tracking system as August. The latest is that we might hope to get the kit delivered late July or early August. BTW: sorry for the lack of posts. That will be a relief to some of you but others have been asking where I’ve got to. It’s been a busy first half of 2017 with three trips to the US since my last post (Dallas, Salt Lake City and Sacramento, Clearwater (Florida)). I had planned a bunch of updates but I just haven’t had time. Hopefully things are going to quieten down now for the next few months. I have also managed to get a morning over at the dealership (Williams) to take some pictures of a factory built 420R. I’m hoping the images will give me some reference for when the jigsaw puzzle finally arrives.